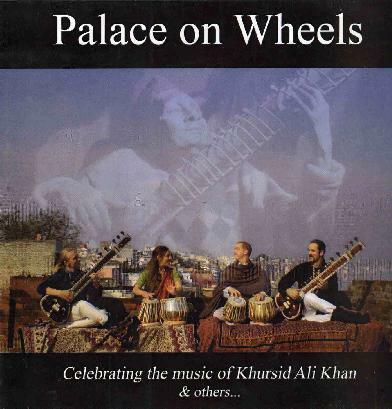 Palace on Wheels - "Celebrating the Music of Khursid Ali Khan and others"
Palace on Wheels was recorded in India in January 2008. KG West, guitarist from the Swedish band, Siena Root plays sitar and he is joined by Stian Grimstad on sitar, who has also guested with Siena Root. Moa Danielsen and Hugo Widén play tabla drums and Tes Varnier the Tanpura. The CD is only 32 minutes and features one amazing long 28 minute track called Raga Jog (split into 3 parts on the CD). Like most ragas it starts off slowly and builds up and takes the listener on various highs and lows of expression. Soul Sangram is short at just under 4 minutes, but again amazing and very special music, with a lot of feeling. Amazing sitar playing for two young Swedish guys but these guys are very dedicated to the instrument and travel to India every year for training. This might be their first real CD release of sitar music.